Finca Duende is the perfect place to get away from the bustle of normal life. Here time still goes a bit slower. The finca is apart of the beaten track in the the middle of nature with a fantastic view of the surrounding valley and the mountains. The only sound around are the bells of the wandering goats and the chirp of the birds. Hikers can start directly from the house for different round trips. 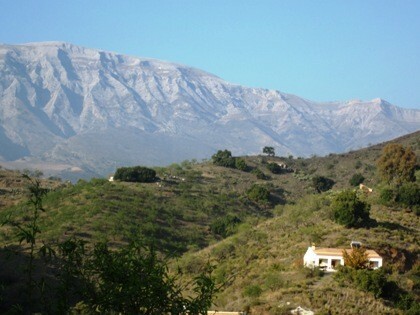 In the nature parc of the Sierra Tejeda there is a large variety of hikes. Very often you are deeply in the mountains and have a spectacular view of the mediterranean sea. There are hiking guides for your use in the house. Many interesting destinations like the historic center of Malaga, the Alhambra of Granada, the city of Antequera, the Nerja caves and numerous white villages are reachable within a 30 up to 90 minutes drive. You can get to different beaches in about 40 minutes. We also would be pleased to give you some recommendation of local bodegas, restaurants and other nice destinations like a wolfparc. After enjoying our delicious breakfast you might want to use some of our other offered service like lunchpackages, barbecues, tapas-dinner, house own shop and so on. The whole house with big kitchen, dining room, porch, swimming pool, different terraces and the garden is for the use of our guests only. Sedella is about 6 kms away. There is a smal supermaket, a farmers market, different bars und restaurants. Sedella is a very well looked after white village and you should visit it. Azul: A double bedroom heading west including its own terrace. Perfect for the sundowner. Blanco: Our luxury accomodation with a waterbed (1,80m x 2,20m). Blanco has its own terrace towards east for a nice wake up with the sun. There is also a second room between the sleeping room and its bathroom with a folding bed (1,40m x 2m) to sleep another person. Amarillo: Another double bedroom with big terrace doors opening on a small path which leads to the swimming pool. The prices are for two persons including breakfast. 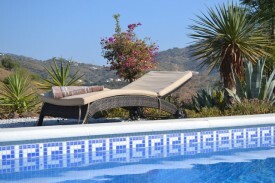 For a short stay of only one or two nights plus 10 € per night. Staying with three persons in Blanco plus 10 € per night. With single occupation of any room minus 10 € per night. We offer further reduction on request for a long stay of at least two weeks.You can also rent the whole house for six to eight persons. Breakfast is daily prepared. We use a large variety of local and fresh products. (fruits, vegetables and juices of the saison, different bread, cerials and yoghurts, homemade marmelades, different cheeses and cold meat). We offer barbecues as well as tapa dinner. Snacks and depending on availability fresh vegetables are sold in our little shop. You can also use the big kitchen for self-supply. The next restaurants are in Sedella about 6 kms away. Two crossbikes are available for renting. Unfortunately not suitable for disabled. 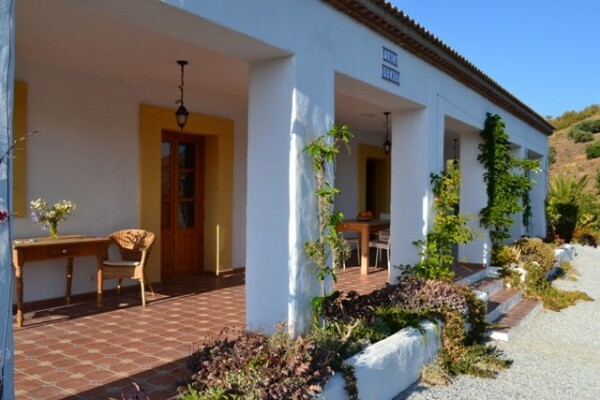 Did you stay in Finca Duende? Let us know what you thought about it and help others to make the right choice! * I confirm having stayed in Finca Duende. Find other bed & breakfasts in Sedella, all bed & breakfasts in Málaga or all bed & breakfasts in Andalusia.